Home News Astorians speak out about Astoria Cove! Astorians speak out about Astoria Cove! Your fellow Astorians, Lucille Hartmann, Mgr., Community Board 1, George Stamadiates, Vice Chairman, Elizabeth Errico, Co-Chairman of the Zoning Committee, Richard Khuzami, Chairman of Parks Committee, Frances Luhmann McDonald member and Norm Sutaria, resident all spoke Wednesday at NYC Planning Commission public hearing regarding Astoria Cove plans to build the huge residential/commercial development in Astoria. 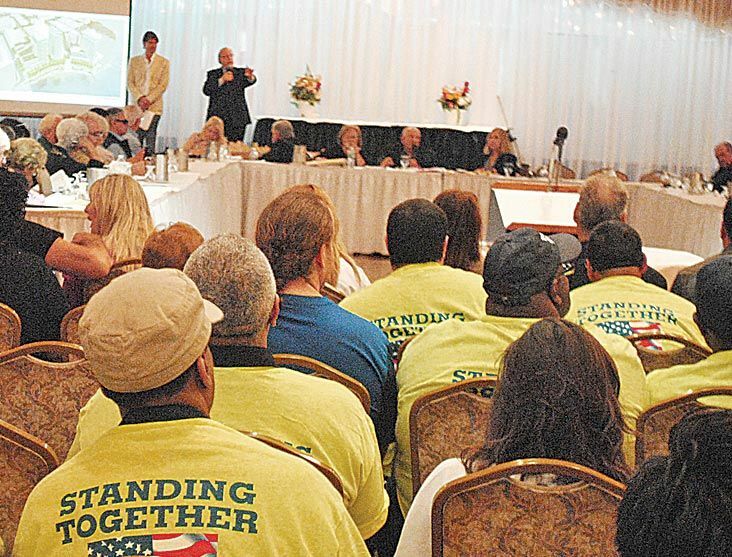 Essentially the group reaffirmed and supported Community Board 1’s motion to NOT support the plan’s approval unless and until ALL of the stipulations of the board’s motion had been met. Eg., Increased amount of Affordable Apartments. Khuzami also added plans for specific Park plans and improvements that were approved at a Committee meeting with the Dept. of Parks last week. Also present and speaking were representatives of the various unions demanding good-paying jobs and sound construction. Many of these representatives also live in Astoria. What a town! The meeting lasted over 5 hours with many of your fellow Astorians making the return-trip by subway between City Hall Station and Steinway Street Station. Those speaking in favor of the plan were mainly representatives and attorneys for the developer stating that this development was a good thing, especially for the surrounding community which is currently under-served especially in public transportation and shops. We took the opportunity to tell City Planning how the developer must do better! Somehow I feel those speakers didn’t come by subway! Frances Luhmann is a lifelong Astoria resident, and writes her views on local politics as Political Junkie. Previous articleWho doesn’t love some Johnny Cash!? Next articleAlicia Sable: Alpha House Actress!